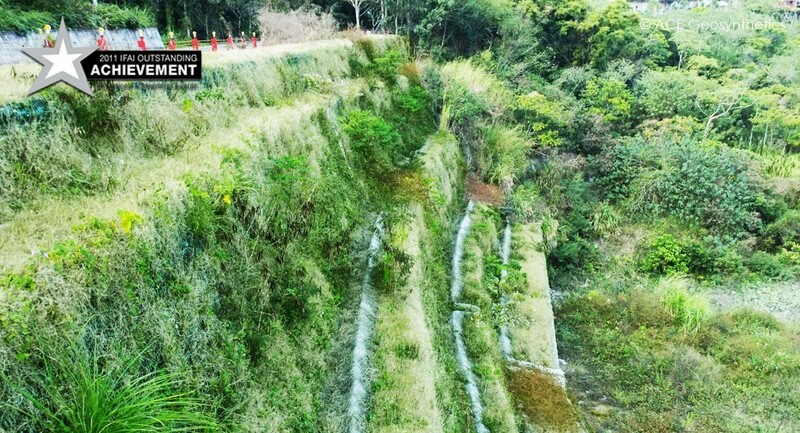 This project is located in Route 131 in Nantou County, Taiwan.Based on the investigations of regional geologic survey, there are several fault zones pass through the site. As a result, the geological conditions are very poor, and the rock formations are fractured and weak. In 2007, a significant landslide up to 80m wide and 30m deep occurred due to a torrential rainstorm. 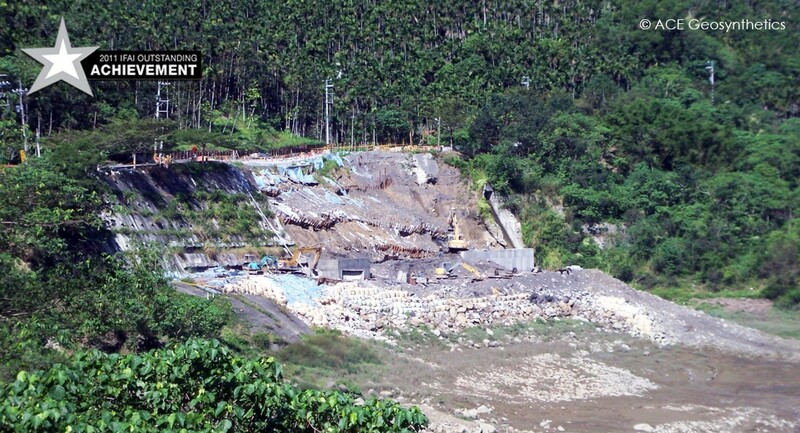 The existing anchored downslope was severely damaged with the main structure being pulled out and exposed after the landslide, forming a massive heave at the toe of the slope. 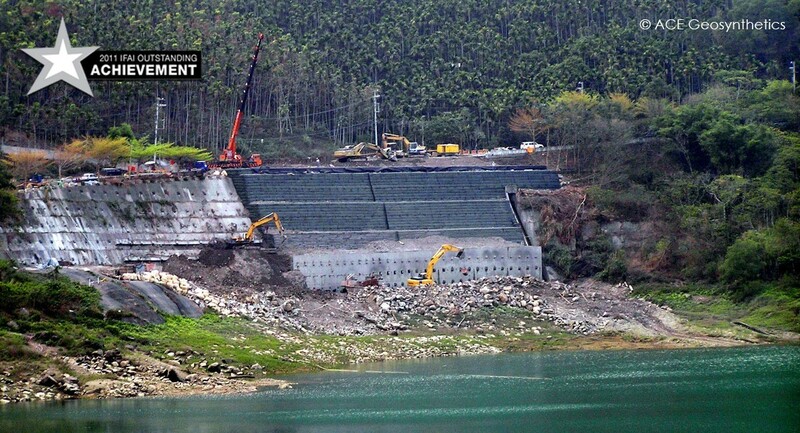 Because the site is located in the water supply reserve area of Ming-Tan Reservoir, the toe of the slope was vulnerable to scouring due to water level fluctuation in the reservoir. After careful stability analysis, a composite protection system was adopted. To meet all the requirements of the project, the rehabilitation consisted of two stages. In the bottom stage, a pile-supported reinforced concrete (RC) waterfront protection wall was built for the lower slope below the highest water level. Drilled concrete piles (1.5m in diameter, 20m to 30m in length, and 2.5m in space) were used to support the protection wall (8.5m in height).Ground anchors also were installed to give additional tie-back resistance. 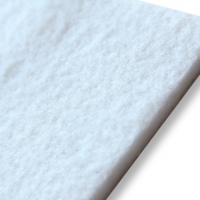 The durable RC structure was designed to prevent any possible instability from scouring. 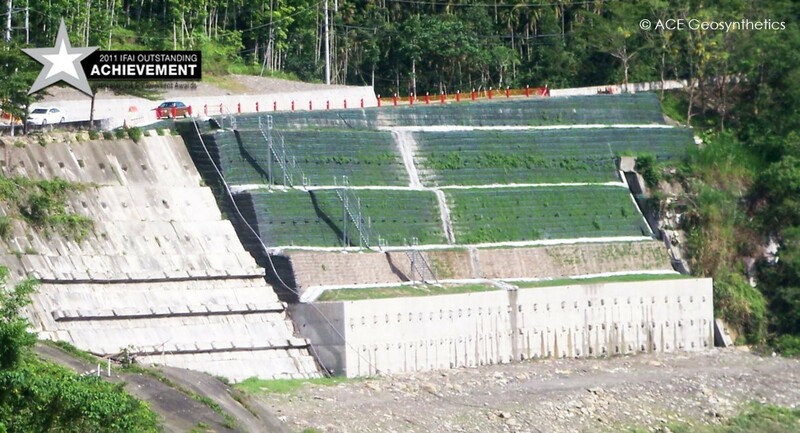 In the upper stage, a wrap-around reinforced earth structure (RES) containing ACEGrid® geogrids,soil bags, and ACEDrain™ drainage materials were chosen to restore the slope above the protection wall. The RES was constructed in 4 sequential tiers up to a final height of 17m using geogrids 8 to 10m long. Each tier was setback with an averaged inclined ratio of 0.3:1 (H:V). 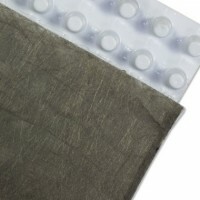 Stacked soil-filled soil bags were used for slope face protection. It also functioned as the medium of planting as vegetated slope was not only good for an aesthetic appearance but also for an eco-friendly environment. Interior and surface drainage systems were also installed properly for the RES to effectively drain the seepage and run-off. The reinforced earth structure with ACE Geosynthetics products provides a simple, fast, and cost effective solution. It can be constructed without topographic constraint and using common equipment with lesser skilled laborers. The RES here also was built using local collapsed rubbles and thus greatly reduced the amounts of waste dumps. Because the complexreinforced structure has shown a sound performance, the deformation rate observed at the site declined from 0.03mm/month to 0.007mm/month within the first 6 months. The gathered information of instrumentation clearly indicated that the sliding has been successfully controlled. 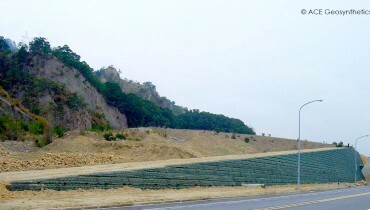 Based on the site conditions, ACE Geosynthetics solution, a custom made system for this project, has proved to be beneficial for this type of slope rehabilitation and is worthy of being considered for other similar conditions.